This porous earthenware cooker is hand made using traditional methods by Japanese artisans. 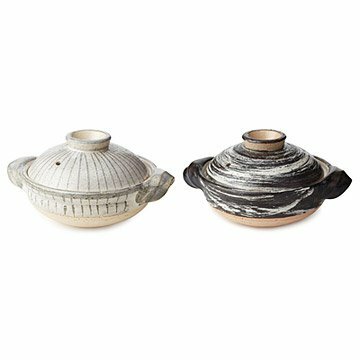 Prepare aromatic casseroles while offering a beautiful focal point for your tablescape with this eye-catching traditional cooker, handmade from earthenware by local potters in Japan. The clay unearthed from the Iga region has been heralded for centuries due to its porous nature and its naturally higher level of heat resistance. Each piece is made in a plaster mold and then shaved with a plane to make a rough surface. The design is dried in the sun for one week before the first firing and base glaze. Then, in a two-person process, a dense second glaze is applied while the excess is wiped off and checked for quality. After a final firing in the kiln and individual inspection, the result is a traditional and beautiful piece of serveware designed to take you from oven to table. Handmade in Japan. Click here to learn how to make Homemade Tofu and Dried Mushroom Risotto using your Earthenware Cooker. Growing up in Tokyo, Naoko Takei Moore was no stranger to rice. She’s since developed an international taste palette, completing her studies at the California School of Culinary Arts, Le Cordon Bleu Program. Though her cooking skills are vast, Naoko appreciates perfecting the basics, which is how she created the perfect cooker and steamer for her homeland’s staple: rice. Naoko lives, cooks, and designs in California. Hand wash with mild soap and lukewarm water. Once cleaned, make sure to dry the bottom of the pot by placing the bottom part upside down to dry. To remove any unwanted odors, fill the steamer with 80% water and a small scoop of green tea leaves and leave to simmer for 10 minutes. Click here to learn how to season your Earthenware Cooker before using for the first time. Be sure to google how to season before use.